Abbey Bike Tools is based in Bend, Oregon USA where the company proudly manufactures all of its products. "Precision is our religion" is the slogan of this small, relatively new and well-regarded organisation. 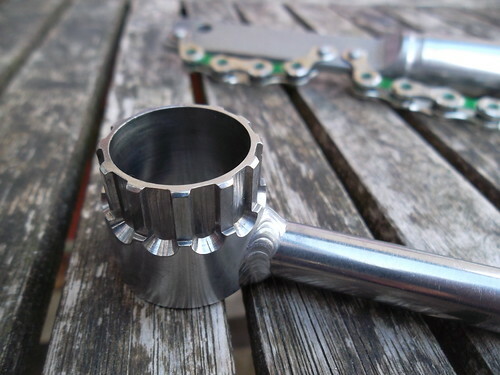 The story goes that Abbey Bike Tools' founder – Jason Quade – created the one-piece cassette tool at the request of mechanic and friend Jeff Crombie who wanted a simple tool that was not commercially available at the time. The name Abbey is an in-joke about how some beer producers borrow words and phrases from the world of biking. I hesitated for well over a year before getting a Crombie cassette removal tool. They are definitely not cheap. I also got the companion tool – the 'Whip-It' chain whip – at the same time, partly because postage and packaging from Germany was no different if one tool was ordered or two. What eventually made up my mind to buy these premium tools (or at least email the details to my wife who – not unreasonably – was reluctant to buy them for my birthday) was a combination of factors. In 1926 the Chancellor of the Exchequer, Winston Churchill, introduced measures that would ultimately do away with Road Tax in 1937. His reasons for doing so included a concern that some motorists felt they enjoyed a special entitlement to behave on the road in any way that they pleased. They did, after all, pay for the roads themselves, or so they believed. Eighty years on and one of the charges frequently levelled against cyclists is that they do not pay 'Road Tax'. They don't, but then neither has anyone else this side of the Second World War. It's perfectly possible that there are some elderly motorists driving around who did once pay the tax, but they are fewer in number as each year passes. 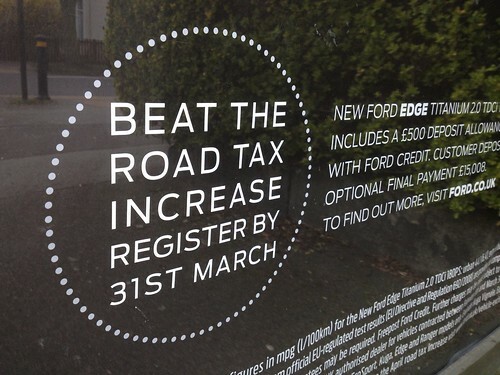 So why, for an alarming number of ill-informed people, has 'Road Tax' never really gone away, even though it may never have existed in their lifetime? 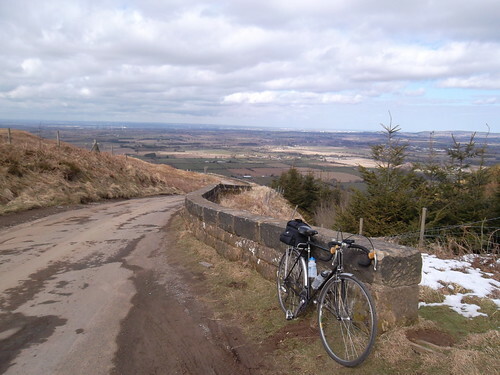 Great British Bike Rides: 40 Classic Routes for Road Cyclists is the follow up to Dave Barter's first publication, Obsessive Compulsive Cycling Disorder. The first, self-published, book was largely an anthology of blog posts that detailed Barter's increasing obsession with cycling that developed when his running years were ended after injury. Great British Bike Rides is quite a different affair, the result of extensive research to put together 40 challenging routes throughout Britain. The rides are divided unequally between northern England, southern England, Scotland and Wales. Last Summer twelve of us did the Way of the Roses ride but with van support and lifts home, this year we thought we would up the ante a little bit. 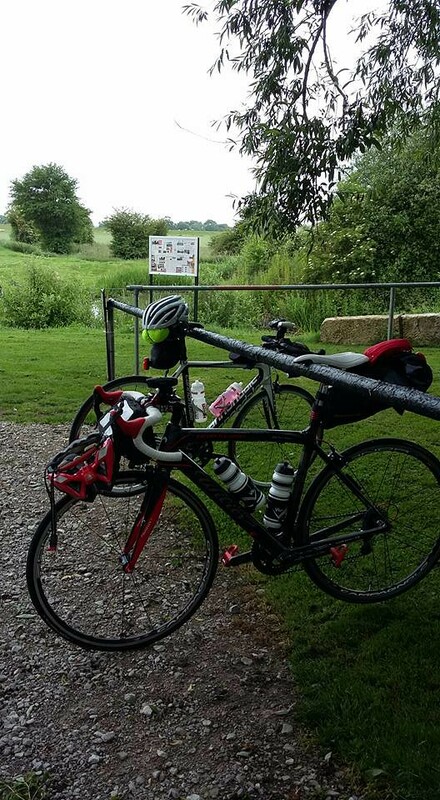 Plan A was to do the Trans Pennine Trail, followed by WOTR but there were conflicting reports on how suitable the TPT was for carbon road bikes. We settled on riding from our home in South Cave to Morecambe and then back via Bridlington. Only two of us were left standing when it came to doing the ride, myself and fellow Cave dweller Tony. As it was Father’s Day weekend our wives were happy to indulge and leave us to play out. We met at 6.30am and headed westwards towards Howden. This is a favoured ride destination for coffee but it was too early for The Cheese Shop. Out first café stop was a real unexpected gem of a find. We were ambling along when we came across a sign saying ‘Birkin Fisheries Tea Room’ and after we both nodded to approve stopping we pulled into their car park. It was then we realised it was still quite early – and the café was closed. As we were about to pull back out we saw somebody having a coffee and a fag by the side of the café. “Let me finish both of these, and then I’ll open up for you” she said. RESULT! Simon Warren describes a ride towards Askrigg (# 46 Oxnop Scar) that I haven't done, but would like to. According to Warren this climb has a height gain of 243 metres. The Harkerside road from Grinton goes from about 186 metres to 541 at its peak. Even if you start counting at Low Witta (about 220 metres) the climb to the top, and the cattle grid shown below, is well over 300 metres of height gained, with more false summits than I can remember, and no fewer than seven Ordnance Survey chevrons pointing at the wearying cyclist. The chap in the B&B in Askrigg told me that drivers' Sat Nav systems sometimes send them along this narrow road. I wouldn't fancy driving it, but how long will we have to wait before 100 More Greatest Cycling Climbs I wonder...? 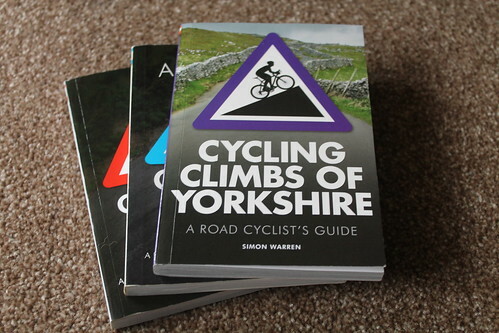 Well I got the follow-up title wrong (the sequel was to be 'Another 100 Greatest Cycling Climbs') and the climb didn't make the cut, but that oversight is remedied in 'Cycling Climbs of Yorkshire: A Road Cyclist's Guide', the latest publication in this popular series. On the last day of August I fell off my bike. Again. 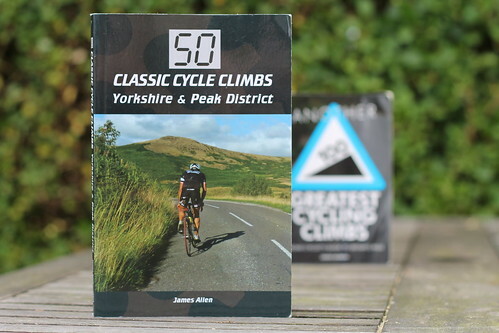 I bought 50 Classic Cycle Climbs: Yorkshire & Peak District from a bike shop in Pickering on a holiday last year during which I rode five climbs that had featured in one or other of Simon Warren's 100 Greatest Cycling Climbs. Perhaps for that reason I find it difficult to review this book without comparing it to Simon Warren's work. Tickets were booked in January and dates were fixed. Mary steadily lost ounces all summer in preparation for the trip; I gallantly made up for her losses. New tires installed in October scraped against one side of the rear mud guard. A rotary tool was used to trim back the edge. The route was undecided. A map in the living room was covered with sticky notes of possible alternatives. I contacted cycletour.org.nz and asked about routes. 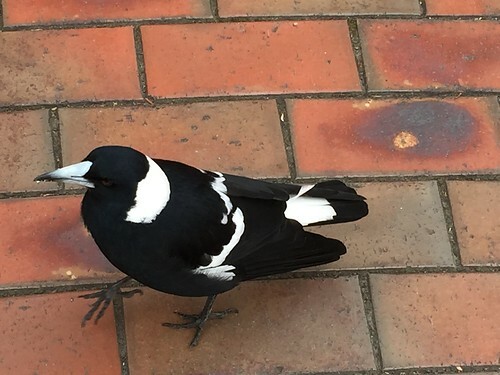 Their advice (very friendly): we should be on the South Island. Our plan is to ride the North Island. Indecision, self-doubt, panic. North Island or South? We flip the map from North Island to South Island. Two days later, we flip it back. 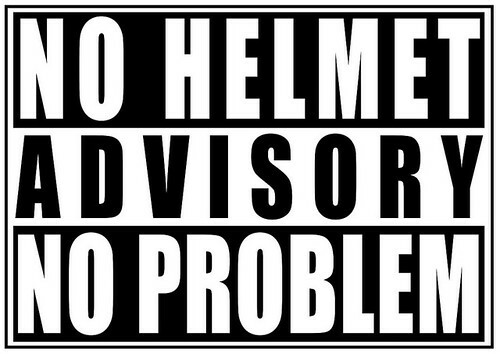 Their other advice: "Beware of maniacal drivers – not me, everyone else." Two weekends are spent packing up Lady CoMo. 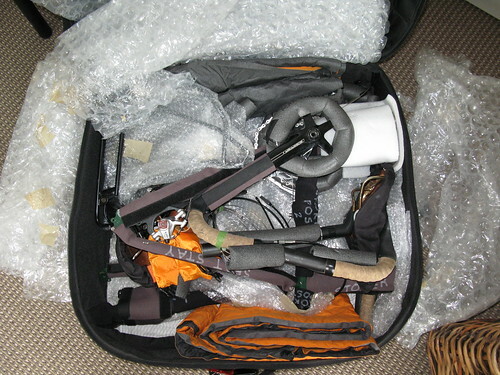 She is padded, wrapped, fitted, cushioned and cradled in her suitcases. Assembly and disassembly steps are listed in detail. We do a practice packup of clothes and camping gear. To camp or not to camp? That is the big and weighty question. One week before departure we check our will and draft a new one. Just in case. I shovel eight inches of snow the day we leave. The two week NZ weather forecast can be summarized in one word: rain. A chiropodist (or podiatrist as they are now known) told me recently I have pes cavus 'type' feet. She said it as soon as I took my shoes off (my feet look normal to me although perhaps my toes do look a bit curled). I went to see the chiropodist because three doctors (general practitioners, or GPs) had told me the foot pain I've had since the start of December is a bit of a mystery even after several blood tests and x-rays. I am not diabetic or overweight, my blood count is normal, my circulation is okay, no arthritis, no gout, etc. I haven't just not cycled for two months but hardly walked except shuffling around the house with bandaged feet. At last this week things seem to be improving a bit; I have got some shoes on.